CASCWA is an organization comprised of practitioners and educational experts who are dedicated to improving school climate, safety, increasing school attendance, reducing chronic absenteeism, increase graduation rates, and addressing social justice inequities. We have established ourselves as the State leaders in professional development in the area of student services. 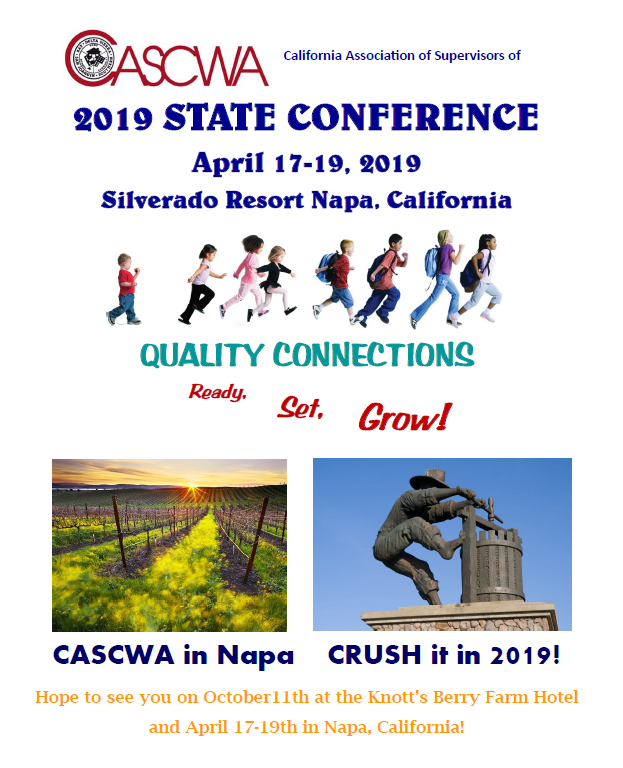 This years State Conference, April 17-19, 2019 at the Silverado Resort in Napas Ca. Check back soon for more details and registration information regarding this years state conference. The last 3 state conference have sold out so do not wait! Start planning your 2019 CASCWA experience using the electronic program and scheduling app. Sort sessions by strands, look for speakers & select your session to customize your schedule. Sign in early and select your sessions before they reach capacity. Individual Conference Rate of $175.00 Must be done online. For multiple occupancy units (Groups), please contact the Silverado at 1-800-532-0500. The multiple occupancy units are designed to reduce the individual cost of lodging for attendees. The California Associations of Supervisors of Child Welfare & Attendance is again proud to host the 2018-2018=9 Model SARB Awards in partnership with the California Department of Education. We look forward to honoring the selected districts April 19, 2019 during the State Conference Awards Luncheon. 10th Annual SCOE SARB Workshop "Improving Student Attendance & Reducing Chronic Absenteeism From Day 1: Prevention to Intervention"
Tuesday, September 25, 2018 CDE Webinar "Data-Driven, 3-tiered Approach to Reducing Chronic Absenteeism and Truancy: The CDE Webinar titled “Data-Driven, 3-tiered Approach to Reducing Chronic Absenteeism and Truancy” will be on September 25, 2018.